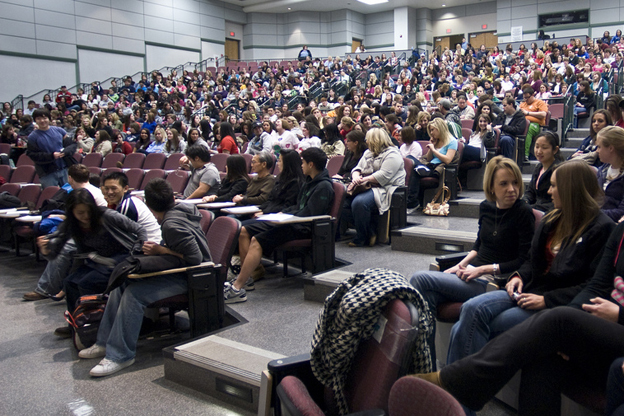 In college, you can expect to have lecture style classes that have a class size of over 100 students. Penn State offers general education (gen ed) classes that almost everyone needs to take and therefore are put in a large lecture hall to allow the most students possible to be able to take them. These classes include science, humanities, math and some arts. The downside: You will miss the intimacy of your 30-people classes that you got used to in high school. Also, the teacher doesn’t start the class by taking attendance so most likely they will not learn your name on their own. The upside: Pen State does have many classes that are larger so in doing so lots of them offer students to be a part of a smaller, lab group that meets once a week. You will also learn very quickly that teachers are very willing to meet with you one on one during their office hours or by appointment when you need it. You will also adjust very quickly to having larger classes without even knowing! Just like high school, you will be given a syllabus on the first day of class. But unlike high school, the syllabus is your new best friend! Teachers put lots of useful information on it like when assignments are due, their contact information, how much each assignment is worth to you overall grade, when tests are and much more. The downside: Lots of the time teachers will not remind you about an assignment or a test until one or two days before because you are expected to keep a close eye on their syllabus. The upside: You can plan weeks ahead of when you are going to do an assignment or study, which forces you to be organized. I recommend having an assignment book/calendar so you can schedule out everything and have a visual that is assigned on the syllabus. You don’t want to be that person scrambling the night before to study or write a paper because you haven’t checked the syllabus in forever! In high school you were required to arrive at school promptly at some time after 7 am and then expected to leave six or seven hours later. In college, your schedule has more freedom. Most college schedules are pretty flexible and offer classes all day from 8 am until 9 pm at night. This allows for breaks in between classes, something that is nonexistent at most high schools. The downside: There really aren’t that many, but long breaks in between classes can lead to you going back to your dorm and taking a nap or getting distracted. This can cause a decrease in motivation to attend your classes, which is never good. Also, it can be a hard adjustment from going to school that ended at the exact same time everyday, to having classes end one day at noon and then the next day at 5:30 at night. The upside: The adjustment to the differing of the day-to-day schedule is not that hard and is usually accomplished a few weeks into class. The freedom of your schedule is also awesome in that you are no longer confined to spending your whole day in one building! I am a strong believer that the breaks between my classes are one of those little things in life that make so happy. I love the freedom of being able to get lunch anywhere on campus while finishing homework I have due for my next class. It’s great! One of the most fascinating differences from high school to college is that you’re in charge of your education. Yes, you are now allowed to wear your hat in class or chew gum. And say goodbye to seating charts because they are a thing of the past! The upside: Congrats! You’ve made it past the pivotal years of rules and regulations and are now deemed as mature and capable of making more decisions about your own life. Emphasis is now put on more things such as the influence your education will have on you, and how you can influence your education. Of course, I cannot describe every difference between college and high school because they are endless. I guess you will have to find them out for yourself and join us here as college students!